Further to your request on providing you further training on the C.R.I.T.E.R.I.A. formula and on how to impress the evaluators with it, I have decided to deliver for the last training of 2018 a session that will introduce you deeper on how to apply the CRITERIA formula with examples. 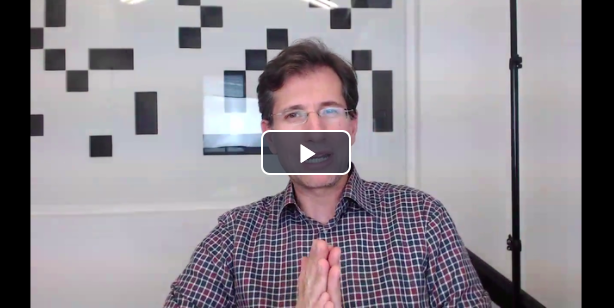 ​First, we take as a use case, how the evaluators evaluate an Horizon 2020 collaborative proposals (RIA - Research and Innovation Action, IA - Innovation Action) and then we examine how the C.R.I.T.E.R.I.A. formula can be applied. 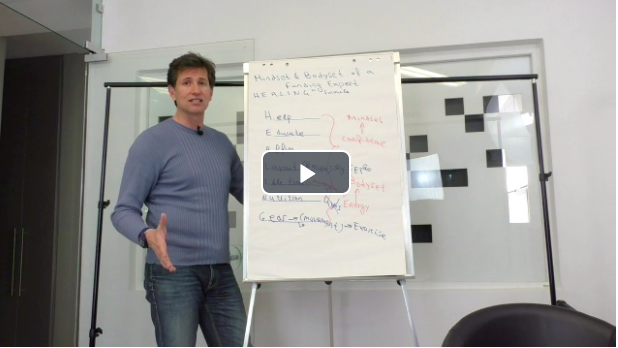 This is a a training video that deals with a very important aspect, that is how to convince others to exploit challenging programmes like Horizon 2020. Our approach is based on the framework in this session. 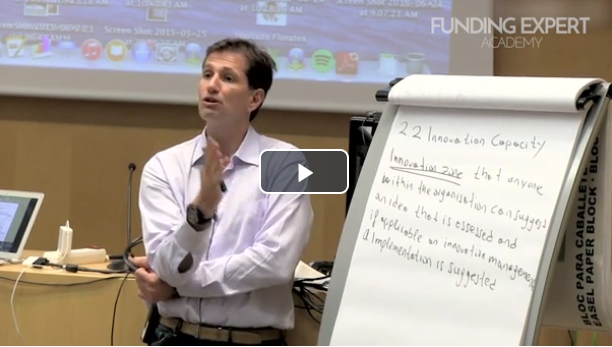 Innovation capacity is a key element in any collaborative H2020 proposal. Innovation capacity it is in principle to foster the capacity of organisations inside and outside the consortium to develop and exploit further innovations. Such a definition implies that Open Innovation and more specifically open access to Data Research is a fundamental factor for advancing innovation to others. Therefore, any proposal under highly innovative programmes such as Horizon 2020 should encourage their research date is Findable, Accessible, Interoperable and Reusable. 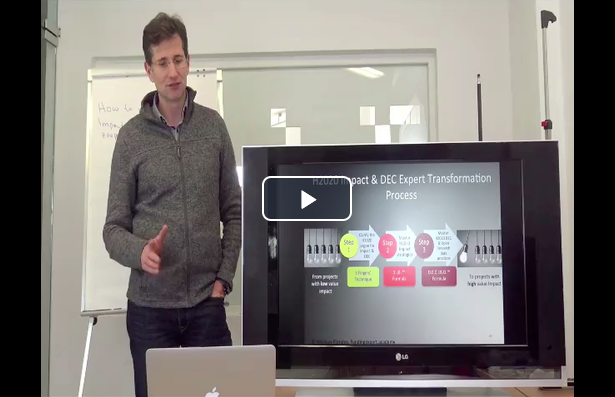 Another tip is to provide a Replication Handbook as you can in this training video. As a coordinator or a partner involved in the development of an EU grant application one of the hot potatoes or critical points that require a lot of discussion and negotiations among the partners is the budget allocation within the consortium. A rule of thumb as a general guide in principle helps a lot and may avoid painful and effortful discussions/ negotiations. The rule is called 80-20 or 70-30 and you can find more in this training session. Many EU grant applicants do not realise that the ultimate aim of having winning proposals is to impress the evaluators. The brain of all humans instinctively tries to avoid pain and attempts to achieve the maximum result with the least effort. The brain of the evaluator is not an exception. More specifically, if a programme has a success rate of 10% (say Horizon 2020) then the brain of the evaluator says subconsciously "There are 90% chances that any proposal that you are evaluating has 90% chances to be a failed proposal, find ways to kill it!). Do you know which country has the highest success rate in European funding programmes? It is Belgium. One of the key reasons for this is that they make sure they connect with key actors from Brussels (EC programme officers, experts, champion grant applicants, etc) that they meet in their offices or in related events taking place in Brussels. 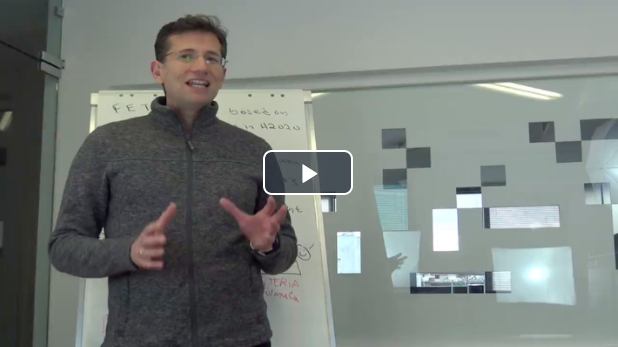 In this video, we train you how to identify and connect with key actors that can give you critical feedback on your proposal idea and its further foundations such as proposal summary and proposal consortium. 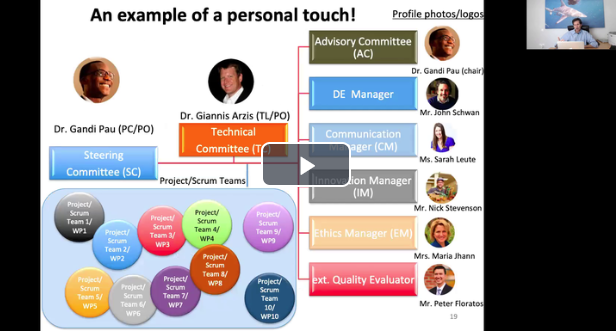 This training video introduces you on how to identify and connect with such key players. Enjoy it! You have asked for it and we offered it. 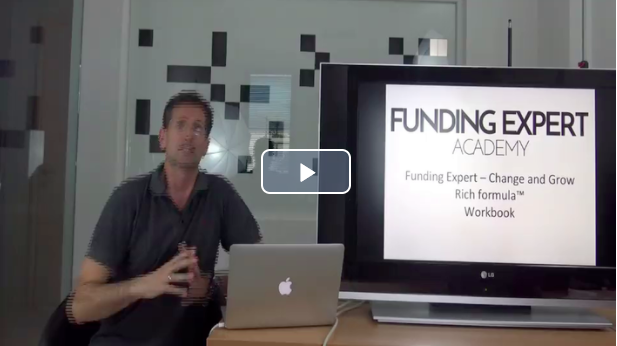 In this video, you will master how to identify the most promising and attractive funding opportunity for your organisation or client. Sucess leaves clues, therefore, we have studied and modelled how champions select the most promising funding opportunity to target and focus. Remember, focus and clarity leads to Mastery and champions follow that approach religiously. As you will see, you need to ask 5 key questions that will lead to the various traffic lights that you need to pass all of them with green in order to ensure that you have identified the best funding opportunity. 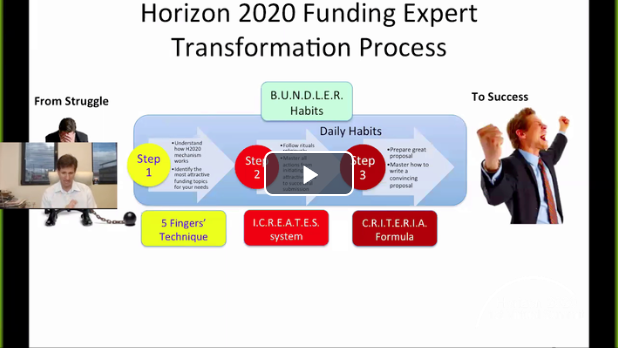 This video has been extracted from the Horizon 2020 virtual summit but it is equally applicable also in all other EU funding opportunities (centralised and decentralised). 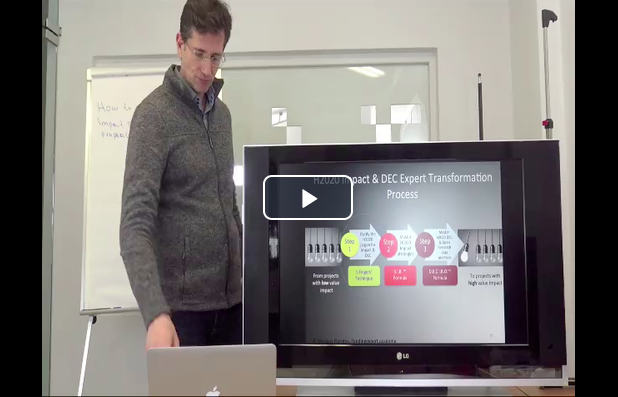 In this video, that is available from April 2018, we conclude the Impact series training. You will learn how to develop four more strategies related to the Impact as well as related key performance indicators and milestones, i.e. 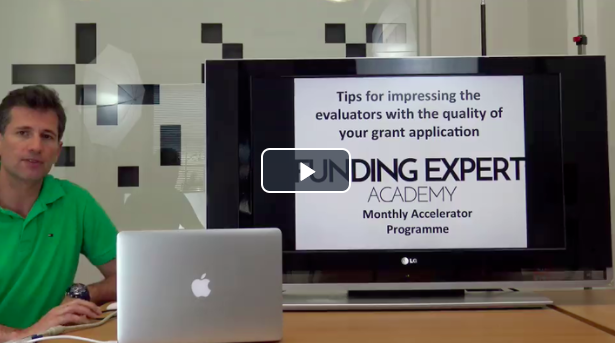 With this Impact series training videos, we are confident that we have provided to you the most comprehensive and detailed guide for mastering the impact criterion in any grant application and not only in Horizon 2020. You have asked for it and we listened. Further to your requests, we start this year to deal with the Impact criterion. 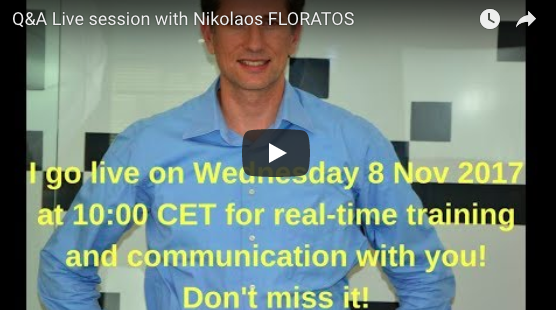 For the next four months, from January until April 2018, we will broadcast here a series of four training videos that deal with Impact criterion which is and it will continue to be the most challenging criterion in any EU grant application. In order to make it more effective also, we will focus our training specifically in Horizon 2020 programme that IMPACT is one of the three CRITERIA and in many types of actions, it has the highest significance but most of the applicants face difficulties to deal with it. 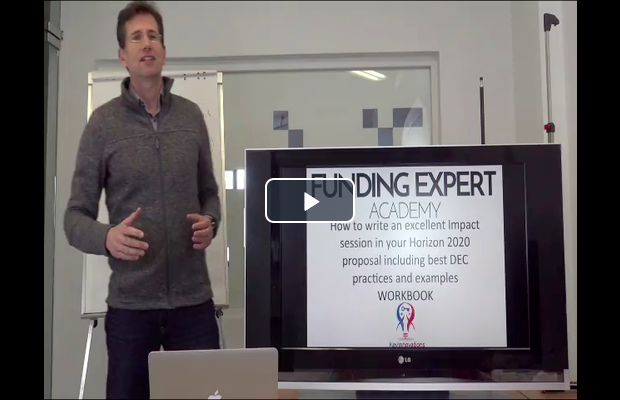 By completing this series of videos, you will master how to write an excellent IMPACT section in any European funding programme and not only in Horizon 2020.This training is part of our Funding Expert Academy programme but we offer it to you here also at no further cost. The only point is that we cannot provide you with the presentation slides as we do with the Funding Expert Academy programme but still the videos themselves are of great value. 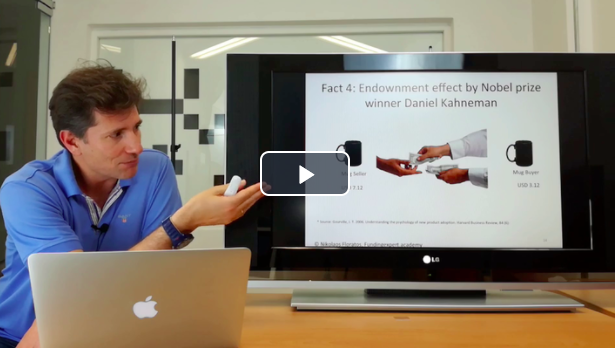 Thank you for your understanding.Enjoy now the first video that will introduce you to the fundamentals on IMPACT and understand the differences and the relationship between Impact, Dissemination & Exploitation, and communication strategies. This is the last training for this year! Can you believe it that already, it has been a year since we launched the FEA monthly Accelerator Programme. In this training session, EC experts and evaluators of your grant application in general have very limited time in order to evaluate your whole grant application and in addition complete their individual evaluation form. Therefore, in this training session, I am teaching you how to immediately impress the evaluators of your application form, even before they start reading it. These are tips based on the general C.R.I.T.E.R.I.A. 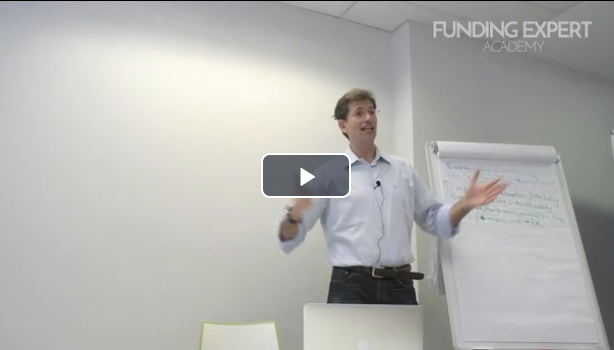 formula and in the next training session, I will be giving you specific ones that fit any grant application. With a success rate of an organisation at 10% what shall they do for increasing it and getting involved in more highly winning projects? 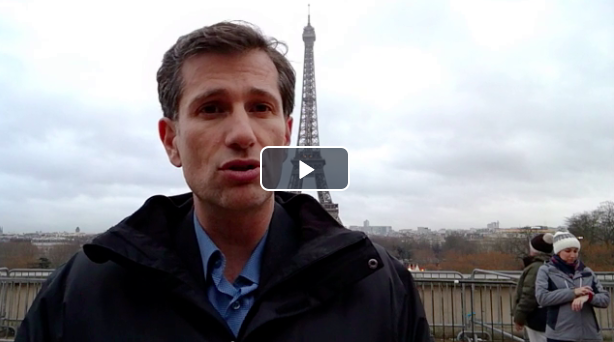 How start-ups can get involved in SMEi or in other Horizon 2020 actions? How organisation can motivate their employees to exploit and get more involved in Horizon 2020 and in other EU funded projects? How to assess the quality of a proposal idea and whether it fits an existing call topic? This is the last part of How to think and act like a FEC with value based on the Change and Grow Rich formula that focuses on how to promote, partner and "sell" your services as a funding expert either externally to clients or internally to colleagues within your organisation. As a reminder, you can download the full set of slides from this link. This is the second part that focuses on what kind of services and how to offer them in a package and why you need to do it in that way. It aims to give you ideas on what kind of services you can offer as funding expert with value externally or even internally as an EU Grants Support Office within big organisations (such as in Research institutes). As a reminder, you can download the full set of slides from this link. This training session consists of three parts and aims to establish you as a funding expert by changing your mindset and make you think and act like a champion and an expert with value. Many proposal developers have the knowledge and the skills to develop winning grant application, especially if they have mastered the FET™ (Funding Expert Transformation) formula. However, in most of the cases, they lack the proper mentality, mindset as well as the tools and practices that can acknowledge them in the market as Funding Experts with value and achieve financial freedom with value. 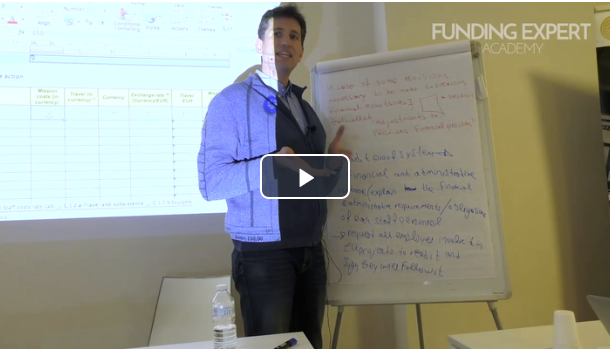 In this month we have the first part that focuses on how to position and sell yourself as a funding expert with value. You can download also the set of slides for all parts (part 1, part 2 and part 3. Next month, part 2 will focus on the Packaging (what kind of services to offer and how to offer them). 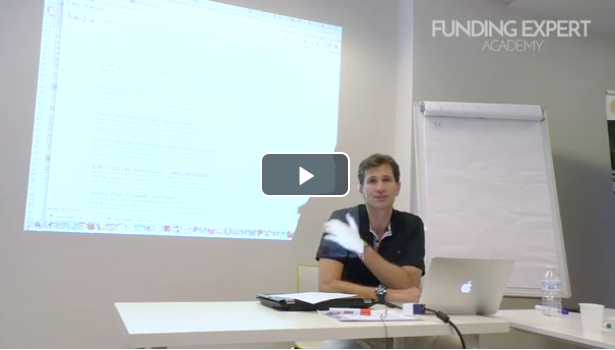 This training session addresses one of the most significant but at the same time underestimated parts in a grant application and especially in Horizon 2020 programme that many actors face a lot of challenges to deal with. You can download the slides from here and print them for taking notes and completing the missing items based on the video. 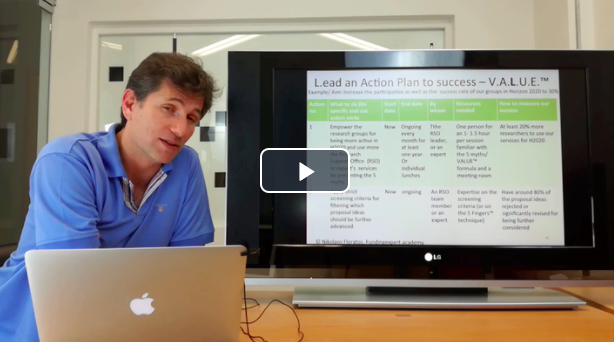 This training video follows up last month's video that we go one step further that is to discuss the V.A.L.U.E.™ formula and an Action Plan for empowering your community (i.e. your team, your colleagues, your clients) to exploit successfully Horizon 2020 programme. Although this training focuses on Horizon 2020, its principles are directly applicable in any other European Funding programme. We have just targeted Horizon 2020 because it is one of the most competitive and challenging programmes and there is a big demand on clarifying and showing the map on how to become a champion in Horizon 2020 based on best practices and lessons learned. ​The set of slides for this training can be downloaded from here. 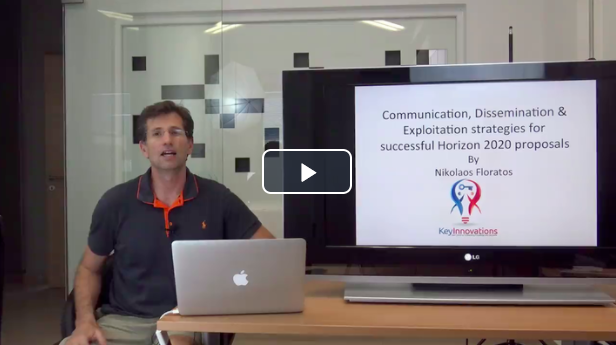 In this training video, you will discover the 5 myths that the majority of Horizon 2020 actors (even some successful ones) mistakenly believe and their related facts that will make you change completely your perception about Horizon 2020 programme which is the most attractive and the largest european funding programme but at the same time the one with the highest competition. By demystifying these 5 myths, you will position yourself as a great expert in Horizon 2020 and will increase your influence in your colleagues and clients. You will discover 5 hidden facts that will boost your confidence and your competence in this programme and become a key actor in Horizon 2020. The principles behind the 5 myths are also applicable in any european funding programme but our facts are based on evidence from Horizon 2020 programme. Before watching this video, please make sure that you have printed our the accompanying slides for taking notes and for easier watching. Access here your workbook notes for this training. 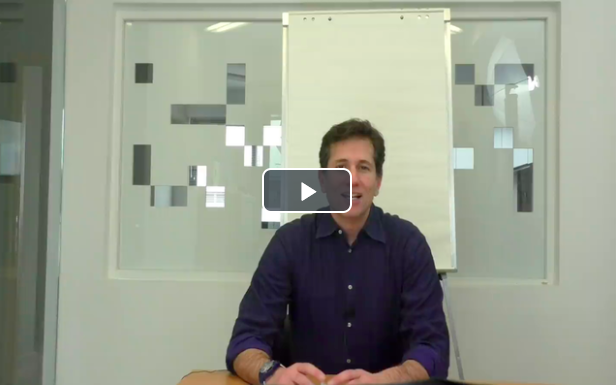 In this training video, I reveal to you the H.E.A.L.I.N.G.™ formula for boosting immediately your confidence and energy level by developing both the proper mindset and bodyset with some easy actions. Especially professionals that develop grant applications experience a lack of confidence and energy during the proposal development cycle. There are many factors for this such as lack of resources and experience or exhaustion or no focus, or over occupied with other tasks, or limited time, etc. However, without the confidence or belief that your proposal will be successful as well as without the required energy for reaching and maintaining your highest possible levels of activity, creativity and stamina, you will not be able to deliver along with your team an excellent grant application. Download also your personal H.E.A.L.I.N.G.™ - Confidence and Energy Booster Planner for helping you to develop and maintain the proper mindset and bodyset as a Funding Expert. 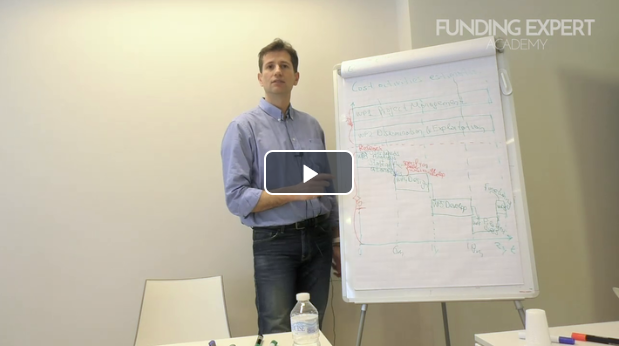 In this training video, you will discover how to engage with champions in European funding by starting from point zero (i.e. with no contacts and with no value). It is a step-by-step guide on identifying the names of the champions that exploit funds and implement European funded projects in your area and how to connect with them so that you are on their radar! Remember, who you spend time with is who you become! Transcend your career by consciously choosing to surround yourself with people with higher standards and success records. This training is complemented by a list of suggested tools for supporting you in finding the contact details of the champions in your area. Think big and build your strategy now for achieving financial freedom as funding expert. Everything is possible with the proper planning, vision, determination and action.